Time-resolved PIV was applied to study fully developed sheet cavitation on a hydrofoil with a spanwise varying angle of attack. The hydrofoil was designed to have a three-dimensional cavitation pattern closely related to propeller cavitation, studied for its adverse effects as vibration, noise, and erosion production. For the PIV measurements, fluorescent tracer particles were applied in combination with an optical filter, in order to remove the reflections of the laser lightsheet by the cavitation. An adaptive mask was developed to find the interface between the vapor and liquid phase. The velocity at the interface of the cavity was found to be very close to the velocity predicted by a simple streamline model. For a visualization of the global flow dynamics, the laser beam was expanded and used to illuminate the entire hydrofoil and cavitation structure. The time-resolved recordings reveal the growth of the attached cavity and the cloud shedding. Our investigation proves the viability of accurate PIV measurements around developed sheet cavitation. 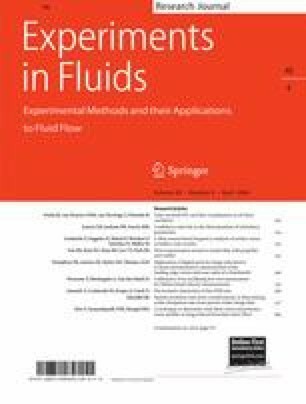 The presented results will further be made available as a benchmark for the validation of numerical simulations of this complicated flow. This research is funded by the Dutch Technology Foundation STW project TSF.6170 and Royal Netherlands Navy. See http://www.stw.nl for more details.